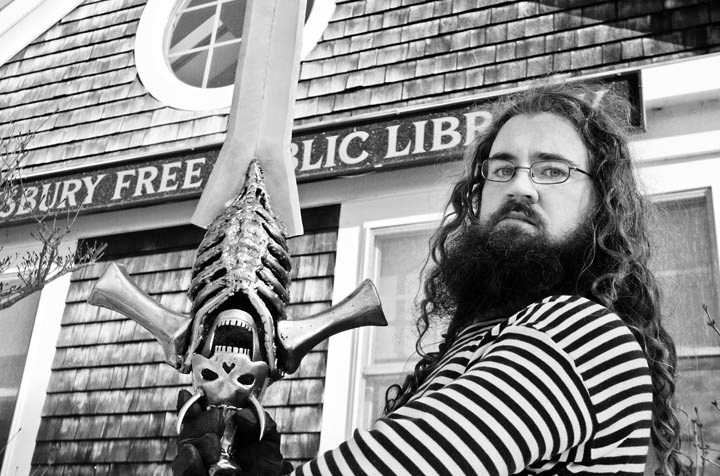 West Tisbury resident Michael Craughwell crafts swords often used as artistic renderings for fantasy video games. Two filmmakers have been on-Island for about three weeks following around sword maker Michael Craughwell for a show which will air on the Discovery Channel. A resident of West Tisbury with his wife and two children, Mr. Craughwell does not make just any old swords. His swords are huge, some reaching eight feet in length, medieval, and often used as artistic renderings for fantasy video games. Mr. Craughwell’s “Buster” sword, six feet long with a single edge approximately one foot wide, first appeared in the video game Final Fantasy 7, as Cloud Strife’s trademark weapon. While on the Island, Raymond Martinez and Aaron McKenna have filmed Mr. Craughwell and his swords at the Charter School, Island Alpaca, Dumptique and the Bandstand in Oak Bluffs, to name a few sites. But when they approached the town of Chilmark to stage a controlled explosion at 182 South Road, it was rejected by the selectmen. They said it would not be in the town’s best interest. The stunt would have involved building a fake bomb, along with a small shed, and having a licensed pyrotechnician blow up the shed for the camera. It also would have involved a medieval-style catapult (trebuchet) that is owned by Morning Glory Farm and used mainly for hurling pumpkins. And, of course, some really big swords. Fire chief David Norton had helped find the location, and the filmmakers said the property owner had welcomed the endeavor. Police Chief Brian Cioffi had also been informed of the proposal. Despite the team’s track record working with Oak Bluffs fire chief John Rose on another project, and its assurances that safety would be maintained, the selectmen were wary of how the stunt would be received by the town. Selectman Warren Doty agreed. “I know you guys love these kind of crap films, but we’re just not into it,” he said. The former president of the Martha’s Vineyard Fishermen’s Association said he had “lost all respect” for the Discovery Channel in light of programming that he said endorses the killing of sharks. “We have given out more permits lately than we would normally do,” he added. “Almost every time, there’s more vehicles than they say there is going to be, there is more disruption, they ask the public to move away.” He noted that Chilmark rejected a request in the 1990s related to the filming of Message in a Bottle. “Maybe we’ll just become known as the town that says no to movies,” Mr. Doty said. He and Mr. Mayhew voted against the request, while selectman Bill Rossi abstained. I agree with Jonathan Mayhew. Swords and bombs have nothing to do with the town of Chilmark. How about dolphins, whales, wind-sailing and beautiful sunrises and sunsets? Oh come on now. Chilmark is being a bit silly on this one. I would totally watch an hour long show about sunsets. I need something to fall asleep to. It's entertainment people! I bet in context, it's a really cool idea! Bombs away! Chilmark can now go back to its favorite type of fun: sitting in your expensive house alone and not interacting with anyone. They could build a shed at the dump and do it there ... or shoot it tight enough and do it in a sand pit somewhere, anywhere ... else. Town's have a right to say yes or no ... and with emotions running high after Shark Week, am not surprised how this turned out. It's all just fun and games, lighten up Chilmark! In this day and age, bombs? I agree with Chilmark. No bombs. What do you mean "this day in age"? Obviously he meant the Age of Terrorism. First off, it's a tv show not a movie. Secondly, it's not about the town AT ALL. Third, it has nothing to do with sharks or terrorism. Sounds like some cranky old men who have no clue about what they even rejected. Ignorance isn't the best position to come from when you're making decisions for other people. The real irony of this, is what these people claim as "Crap that they're not into". The scene in question was part of the episode where Mike is suppose to build a project ( a wee bomb) with his little girl, Nova, and get's carried away as if it's one of his commissioned pieces and goes overboard without his little girl. When he realizes the mistake that he's made, he brings his daughter, crew and piece to some location, and after announcing to his little girl that he's sorry for building it without her, proceeds to blow the thing up in a spectacular fashion. They then go home and build her project together. It was a sweet little moment that I'll bet little Nova will remember forever. That's the kind of "Crap" that more families need in their lives. To clarify; the "bomb" in question looked like an acme cartoon "bomb" made from a fifty gallon drum. There was nothing "terrifying" about the thing.